OH HENRY ! HE WAS QUITE A MAN ! There are numerous well – known car owners in the Capital District section of eastern New York State, and most of them had compelling stories to go along with them. But none are any more interesting than Hudson Falls’ Henry Caputo, a salvage yard operator with a yen for excellence in motor cars. While you have to dig carefully around vintage racing sites, to gather up information on the Bob Motts, the Frank Trinkhauses, and the Dave McCready’s of the day, you can use a far wider net to garner info on Caputo. Caputo ran a successful business operation in Hudson Falls called East Side Auto Body, which was actually as much a salvage yard as it was a body shop. Today, the website disclaimer explains that parts are no longer being accepted at the old Burgoyne Avenue location; and I believe this is because the site has some serious environmental issues left unaddressed. When the East Side location was in full swing in Henry’s day, it has always been whispered that a lot more than auto parts came and went from there. One local man claims that, during Prohibition, liquor came down a route through Warrensburgh, and then down to Hudson Falls [guess where]. Bootleggers allegedly used the East Side site to dump liquor and more. [ Nothing anyone has ever proven]. 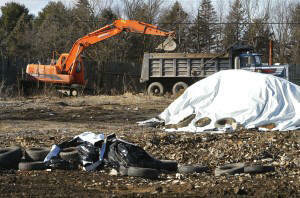 Containment tarps and excavating equipment do their jobs amidst discarded tires at the old East Side Auto Body site in Hudson Falls. Today, Caputo’s former business site is embroiled in local and state controversy and the present owners seem to be stuck with a massive cleanup bill while have to move their entire operation to nearby Fort Ann. Apparently throughout the 1940’s, 50’s, and 60’s little care was taken to keep gasoline and other toxic substances from soaking through the yard and into local water tables. This column, however, is not about the environment - this mention just serves to explain why most of what one would find if one was to Google Henry Caputo would come up with EPA matters. I owe thanks to Dan Strohl, of the Hemmings Motor News website, for a lot of the information I am using here. Caputo was certainly a controversial man. 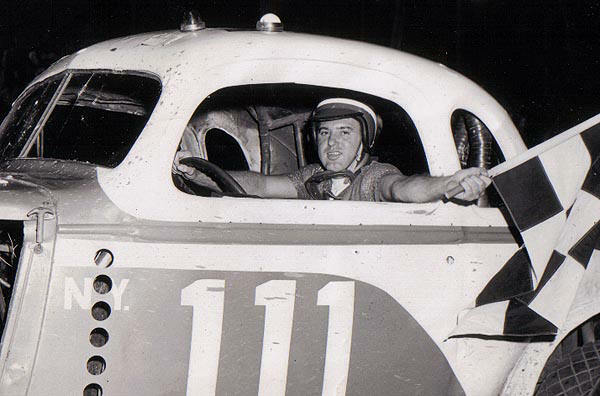 He seemed to get into the race car ownership business in the late 1950’s, fielding cars with a distinctive red and white color scheme and usually involving the numbers 111 or 11. Caputo, known as a particularly demanding owner who would put out the money necessary for a car to be a winner, hired such effective drivers as Jeep Herbert, of Rotterdam; Earl Maille, of Glens Falls; George Baumgardner, of Saratoga Springs; Tiger Tom Kotary, from Rome; and his best – known chauffeur, Ken Shoemaker, then from Whitehall. well be Henry walking around the front of the car towards flagger Chet Hames. Below – Earl Maille, with the Caputo 11NY. The photo isn't clear enough to make who the other man is. The Caputo racing stable is often remembered for the 1936 Plymouth coupe numbered 11NY. This car was variously run by all his drivers except Shoemaker. Of the three, Herbert probably had the most success. Caputo seemed to have an affinity for the Chrysler engines. 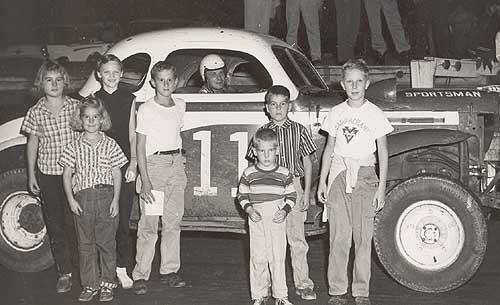 Strohl writes the following about one such engine: “But Henry Caputo seemed to know what it took to win, as evidenced by the day in 1954 he showed up at Fonda Speedway with a 1936 Chrysler DeSoto Series C-8 Deluxe Airstream two-door sedan, painted black and white and fitted with a 331-cu.in. Chrysler Hemi V-8 and Ford three-speed manual transmission. 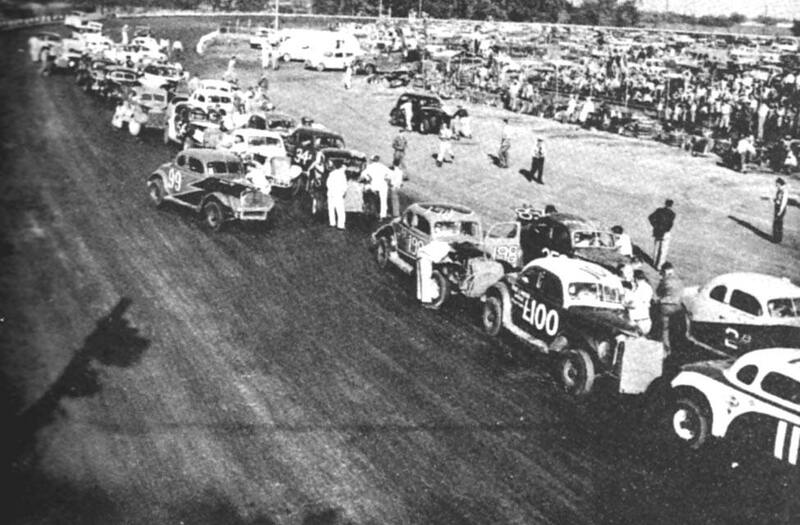 During the warmup period before the races began, the Chrysler lapped the field, alarming just about everybody there, according to Henry Caputo's son, Chuck. Diminutive George Baumgardner was Caputo’s first full – timer, shown here with the Plymouth [above] and one of the Chevies [below]. Chuck goes on to explain that the track official found out the engine was well above the cubic inch limit and it was banned from competition, thus ending any involvement Shoemaker had with Caputo Mopars [he would drive the Chevy from then on]. In fact, Chuck ended up with the car, and that is another entirely different story. The legal Plymouth coupe soldiered on until around 1959, when legend has it that Baumgardner put the car out of its misery. 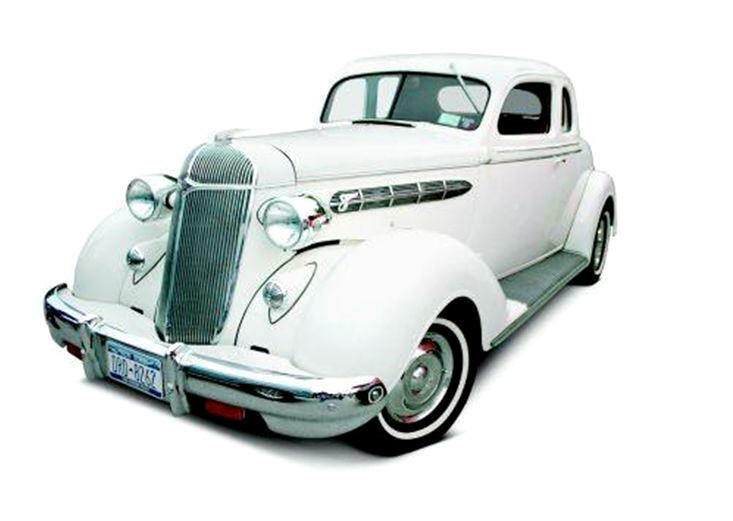 There were apparently two different Mopar coupes and Chuck insists the one that was actually a DeSoto never got painted up as a stock car Another earlier Caputo car, a 1936 Chevy coupe also #11, was seen as often as the Plymouth. It appeared [based on checkered flag photos] to have had more success than the Plymouth. It is not clear if both cars would show up at a track together or whether – in fact- they even existed at the same time as one another. Happier days for the Caputo team, with Jeep and some kiddie riders at Fonda. The last Caputo Chevy would definitely overshadow any other Caputo team car with Shoemaker at the helm. 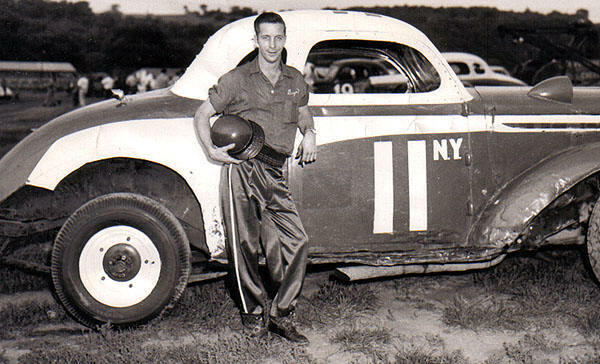 Reports have it that Caputo had the smarts to have the car built by Crescent, NY hired driver Irv Taylor and some other highly – able people Taylor knew. The team ran that other, earlier Chevy coupe before the one built for Ken Shoemaker; but that new one would have the most success for them. 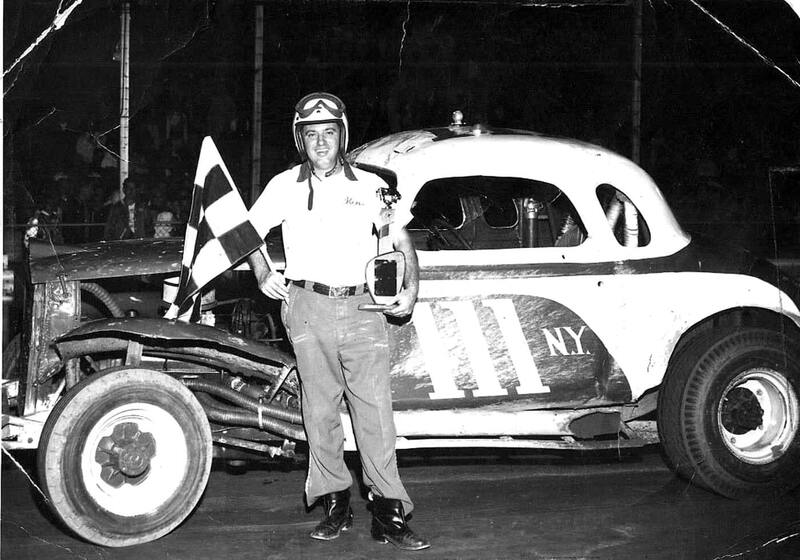 In fact, it may have ended up being one of the most successful sportsman coupes of that history – rich era in eastern NY racing. This is where legends and facts do not mesh. The Caputo team was pretty well done by 1960, and the track [Otter Creek Speedway, Waltham, VT] at which Baumie was supposed to have wrecked the Plymouth did not open until 1961. A second story is much more likely. New York racing legend Wes Moody and pal, Jim Hoyt, claim that they went down to Caputo in Hudson Falls in 1959, around the time his team was dissolving, and bought “what was left” of the earlier Plymouth. Hoyt, whose father was opening Saranac Lake Speedway in their back yard, loved Mopars and would eventually build a beauty of his own. The pair claim the Plymouth was toast by then and they ended up scrapping most of it. Ken Shoemaker was definitely Caputo’s [and Drellos’] best driver. Above, the various roof knickknacks can be clearly seen. [Below] The Hoyt/Moody – built Plymouth which Jim had at Saranac Lake. 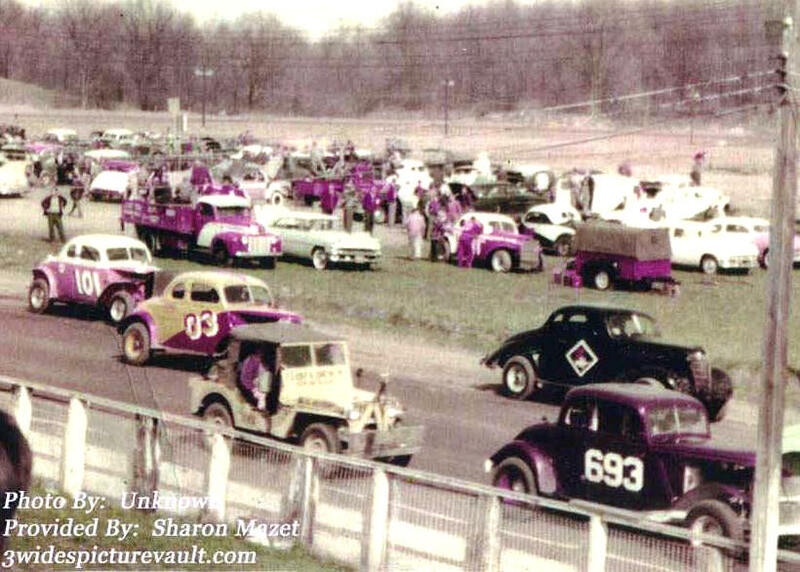 With the Chevies showing the most promise at tracks ranging from Plattsburgh’s Airborne Park Speedway in the north, and Bennington, VT’s Stateline Speedway in the south, the Caputo emphasis had swung to Chevies. Shoemaker was sometimes darned near unbeatable in the 111. The team put together another car, which was either called the 111A or 11, but it never achieved the success of the Shoe car. Severe problems arose in 1959 that would not only sidetrack the Caputo juggernaut, but they would sideline Henry, as well. Local newspaper accounts cover a big story from 1959 in which Henry was convicted of being part of “a conspiracy of filing false proofs of claims of automobile damages with insurance companies”. It was a huge thing at the time, involving over two dozen people and multiple counts. He was sent to the state’s high – security Dannemora Prison, in northern New York. Former Dannemora personnel such as Jack Rugar, who knew Caputo from racing days with Vic Wolfe and driver Bob Bruno, recalls Caputo being at Dannemora. Caputo was doing nothing there to stand out; and this is good because acting up at that prison was very bad for anyone’s health. Bob Mackey Photo Courtesy of Mike Watts, Sr. 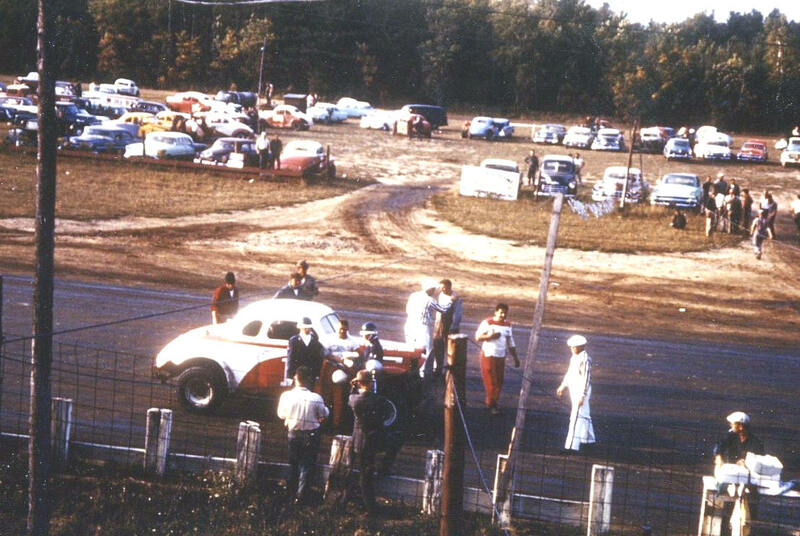 Frantic action in the Caputo pits at Airborne. This is a pre – Shoemaker Chevrolet, and the red – jacketed driver is likely to be Jeep Herbert. Below – Even Tiger Tom Kotary took a turn at the Caputo Chevy before Shoemaker. Looks like he did OK. The Caputo conviction was the end of the racing team. He was bought out by Fort Ann septic tank business owner Chris Drellos, who went on to huge success with that same #111 and Shoemaker. Drellos also had the intelligence to hire good drivers and put good money into the operation. Besides Shoemaker, he had stints with Herbert, Paul Marshall, and Pete Corey. Drellos, who kept the trademark Caputo graphic scheme and colors, would not enjoy team ownership even as long as did Henry; Chris was found to have cancer not too long after acquiring the team and may not have fielded cars after 1963. The Caputo 111 car was sold to prominent owner Frank Trinkhaus. Sadly, tragedy again followed the car. Trinkhaus' new driver, Lou Smith, was killed in the car. 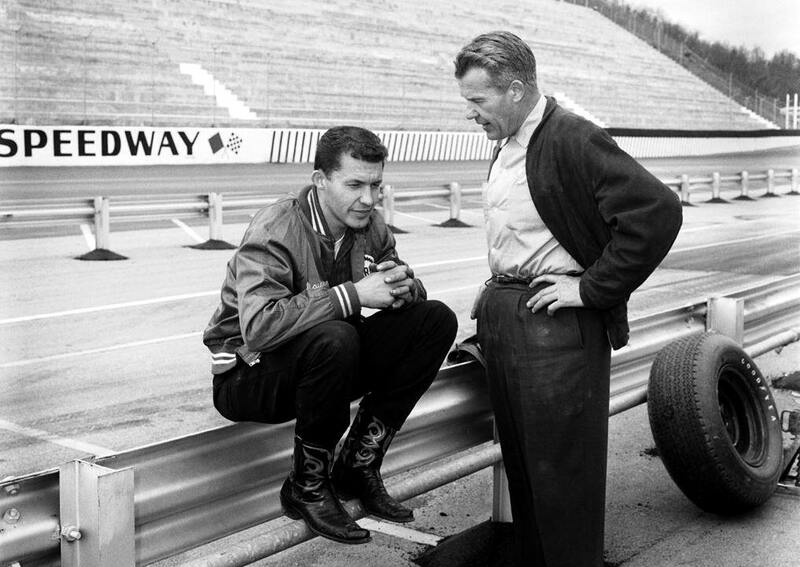 A crewman confers with Lou Smith in the former Caputo car. That well – used 111 was lethal at Fonda and nearly unbeatable at the aforementioned Otter Creek track in Vermont. I always marveled at the strange roof on that 111 – it had holes, flaps, and various mounts – the use for all of which seemed to be gone. I now know why Shoemaker’s roof was the way it was. Firstly, the Caputo team tried a few races at the high – banked, high – speed Lebanon Valley track. Shoemaker had a helluva time getting used to the car in the turns , wherein you couldn’t see much because the angle of the banking meant the roof was in your line of vision. Shoe finally had the crew cut a couple of flaps in the roof metal that would be opened at the Valley. He could actually see a little out through those two holes, which were then bent closed everywhere else. Jeep, in the Caputo Plymouth, gets a birds eye view of the horrible Corey accident at Langhorne, at which there were spectator fatalities. Jeep was not involved. Below – This shot of the 111, after it belonged to Drellos, shows the busy roof leftover from the Caputo days. In an interview Kenny did with Dan Strohl of Hemmings Motor News, he claimed that Henry Caputo was the most demanding car owner he ever had. However, it should also be pointed out that, in his autobiography, Shoemaker said Caputo “was a nice guy and still is”. Caputo felt Shoemaker was not pushing the car hard enough and was using the brakes too much. [Anyone who ever knew the Shoe knows how utterly ridiculous this was]. So, Caputo had lights mounted on the roofs of the two team cars that would come on when the brake was touched. Furious, Shoemaker insisted that Henry ride along as he showed just how much he used brakes; Caputo declined and the soon, only the light socket was left on the roof. The other socket came from a brainstorm had by Harry Chase, a friend of Fonda Speedway announcer Mike Valchovic. Having been close to the Kiekhaeffer Marine Chrysler 300 cars in the mid 1950’s, Chase had seen the value of in – car radios. He rigged up the Shoemaker car up with a radio and a big antenna. By the time Drellos was stricken with cancer and the team was sold and split up, the 111 had all of those remnants on the roof for Frank Trinkhaus, the car’s final owner, to get rid of. Ironically, Taylor, one of the original builders, was the last to drive it. Jeep climbs the Welch 77 driven by former Caputo team mate George Baumgardner. This was that evil Drellos backup car he was stuck with. Caputo would eventually serve his term and get out of prison to return to his auto business. Shoemaker would go on to complete a very long career, with his next car after the 111 perhaps being the best car he ever had [Cliff Wright and Bob Zautner’s 24]. Herbert would retire as a hall of famer as would Irv Taylor. Maille would be badly injured in Warrensburg and retire; Baumgardner, who was older than the others, retired by 1965. Highly – clever engine man, Edwin “Shortstroke” Wright, would go on with the cars to Drellos; and the huge successes of both teams were a testament to his ability. Shoemaker ended up with another top flight ride after the 111. However, Caputo had an engine man of his own. Ballston Spa mechanic Frank DeGregorio looked more like a mafia enforcer than a mechanic. A huge man, he could an engine block with outstretched arms, grasping by the sides. One time, when an official told Henry that the Caputo engine was going to be torn down, DeGregorio snarled, “Yer goin' through me if ya think yer tearing down this engine !” [It didn't happen, says Chuck]. because the Pettys were sometimes running an Oldsmobile at that time. 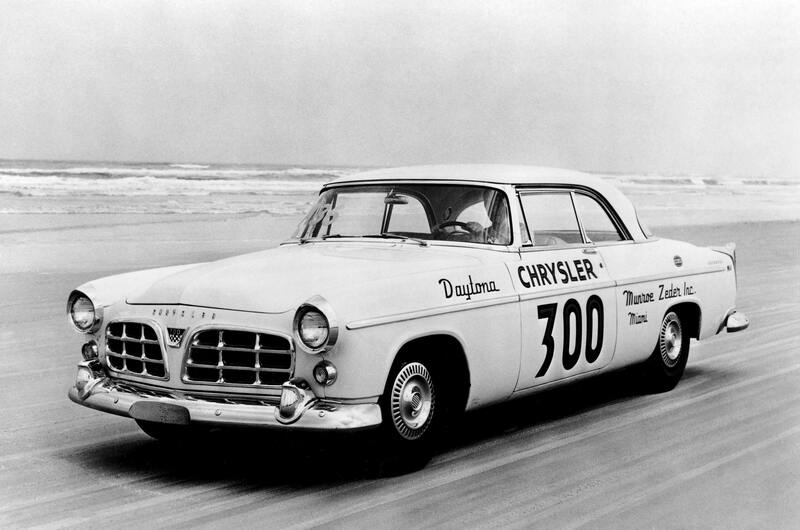 A Chrysler 300 racing along the beach - just like in the story. Chuck also told me of one particular “Southern Tour” the family had in 1958 – before the existence of the big track in Daytona. Henry took an Oldsmobile convertible and drove it down to Florida, where he would compete in a race on the Beach Course. According to the younger Caputo, Henry would subsequently drive it back home, remove any special equipment, and sell it as a used car. The best part of that story is when Henry met up with Lee Petty and ended up drag racing a Chrysler 300 with Petty, who was similarly equipped. Caputo has photos of this and of himself, a teenager, horsing around with a young Richard Petty on the beach. According to Chuck, Henry was a good driver; he once went to Langhorne with a race car and proceeded to record a better lap time than did his hired driver. I think both Herbert and Baumgardner drove Caputo cars at Langhorne. fielding cars at that time. More like 1957 or 58. Chuck Caputo likes to tell the story of what happened to that DeSoto that was drummed out of Fonda for having too large an engine. Caputo gave the car to Chuck and helped him turn it into a striking enough street car to attract the article on the Hemmings site. Chuck does allow where he managed to get into a few hot situations with the potent car as a young man. Perhaps the chrome story told by Chuck best sums up Henry Caputo as a one – of - a kind man. The car sat around while Chuck was in the military and was eventually taken off the road when the motor developed a knock. Henry intervened when his son was just going to have an inexpensive paint job put on the car. The Caputos ended up taking off and cataloging every chrome part on the body. With a good white paint job on and velour added to the interior, the 174 pieces were sent to a chrome shop in Kingston, NY. Henry gave his best evil eye and told the guy there were 174 pieces to be done and he had better get 174 pieces back or he’d burn down the shop. The Chuck Caputo DeSoto coupe, briefly the scourge of Fonda. Well, the pieces were done just fine, but that particular shop did burn down. The New York State Police were very interested in talking to Caputo, whose name was all – too familiar to them because of the prison time. Chuck really did not appreciate all that attention on him as car owner. Henry shook it off with “Aw, we were just kidding”, but Chuck always wondered who “we” were. Did Henry have a mouse in his pocket ? The coupe has ended up with Henry’s granddaughter and may still have some mayhem in its future. Henry has since left us, but his racing team and some of his other lore remain behind for the rest of us to treasure. They don’t make them quite like that any more. The Caputo hauler sits majestically in the infield at Victory Speedway, Middletown New York. The first Chevy coupe is visible nearby. Another of Chuck's favorite tales centers around one of the team's visits to the Autumn classic at Langhorne. As was mentioned before, it seems that, when the team appeared at a Langhorne race, Henry had actually gone out and achieved a lap speed faster than his driver at the time, which was either Herbert or Baumgardner. The Caputo tour de force was something to behold that year at the big Pennsylvania track – they had put together a 1941 Ford hauler with the same Mopar engine as had been in the DeSoto. The truck, painted to match Caputo's unique red and white color scheme, attracted as much attention as the car. Henry Caputo did not operate race team for long, but he will never be forgotten. He was one of the first of the free – spending, flamboyant car owners which now include Joe Leto and Austin Dickerman – to name two. 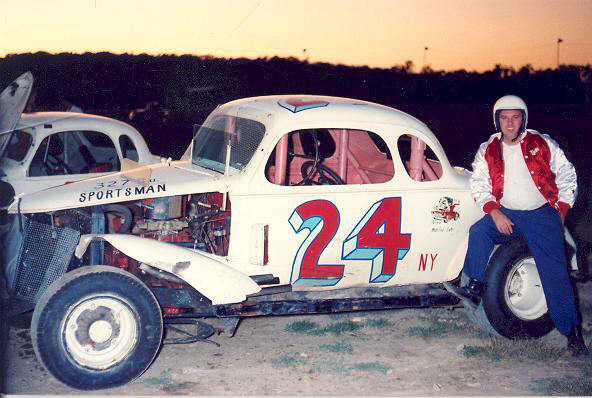 A few modifieds that race at Albany – Saratoga Speedway carry the sponsorship of East End; but, it is no longer in the Caputo family. Henry passed away in 2000, at 83 years old. 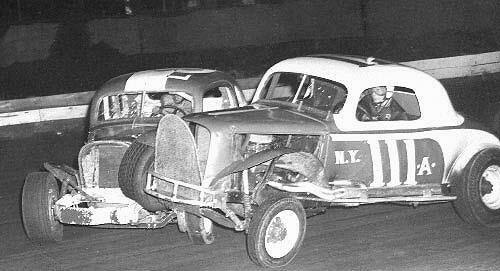 I bet he was still just as tough and high pressure as he was back there in 1958, pushing his drivers.